Beskrivelse Die Maschine führt in einem Arbeitszyklus alle Arbeiten aus, die mit dem Pflanzen von Kartoffeln verbunden sind, d.h. pflügt Furchen, pflanzt automatisch Kartoffeln an und häufelt sie mit dem Boden und formt Schollen. 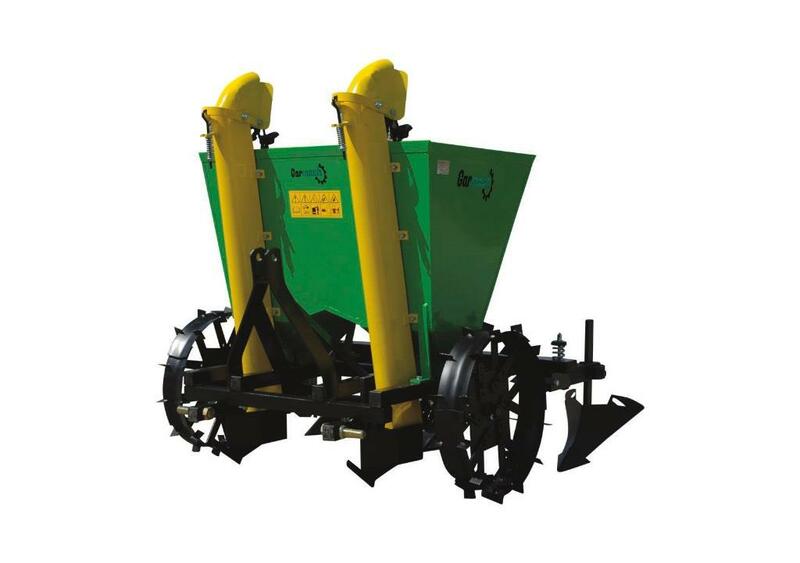 Potato planter Gemini is two-rows planter mounted on the three point suspension system of tractor. The planter is mounted on the tractor with three point suspension system, CAT 2. During single cycle all the activities concerning with potato planting are performed (it makes furrows, automatically seeds the potatoes and ridges the seeded plants with soil). Potatoes can be planted in the interrows 62.5 - 67.5 cm or 70 - 75 cm at variable distances seed in a row (29 cm, 32 cm and 35 cm) in the metal wheels and a constant distance of 32 cm in the rubber wheels. Changing the distance of seed potatoes in a row of 29 cm by 32 cm to 35 cm can be achieved by changing the diameter of the wheels. Planting depth is 10 - 15 cm. På Mascus Norge finner du [Other] Garmach Potato planter/2-Reihen Kartoffelpflanzmas løkopptaker. Prisen på denne [Other] Garmach Potato planter/2-Reihen Kartoffelpflanzmas er - og den er fra 2019. Denne maskinen er fra - Polen. På Mascus.no finner du [Other] Garmach Potato planter/2-Reihen Kartoffelpflanzmas og mange andre merker innen løkopptaker.